This is on my to-do list as well! Pretty classic illustration. Did you notice Kelsey's mullet? Also, what are the "M19" "E17", etc.? Kelsey Grammer's hair is a good indicator of roughly where in the timeline of Frasier a particular scene or episode is from (the worse it is, the earlier it is). Re. what M19, E17 etc means, this is the OED's abbreviation for when a word was first recorded, so M19 = mid-19th century, E17 = early 17th century, etc. You're not the first person to ask me about this, but I've vacillated somewhat in addressing it, as I could either write a small guide on OED abbreviations or just write them longhand in the definition. Any thoughts? Thanks for sharing the video! It was an entertaining way to start the day. 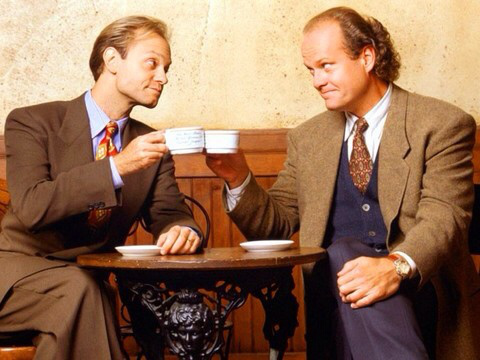 I'm glad you liked it ... if I'm feeling down a bit of Frasier always picks me up!